Sumatra had always been a great island full of impenetrable rainforests, high mountains, volcanoes and vast rivers. However, over the last 100 years the shape of this island has changed drastically. Millions of hectares of the natural plants in the tropical rainforest had been inflicted by the terror of deforestation, which has ransacked 60% of the rainforests in the entire Southeast Asia over the last 30 years. Large areas of the rainforest (including the National Parks in Indonesia) were purposely set on fire during the months from August to November 2015. Within those 4 months over 1million ha of the rainforest were burnt. 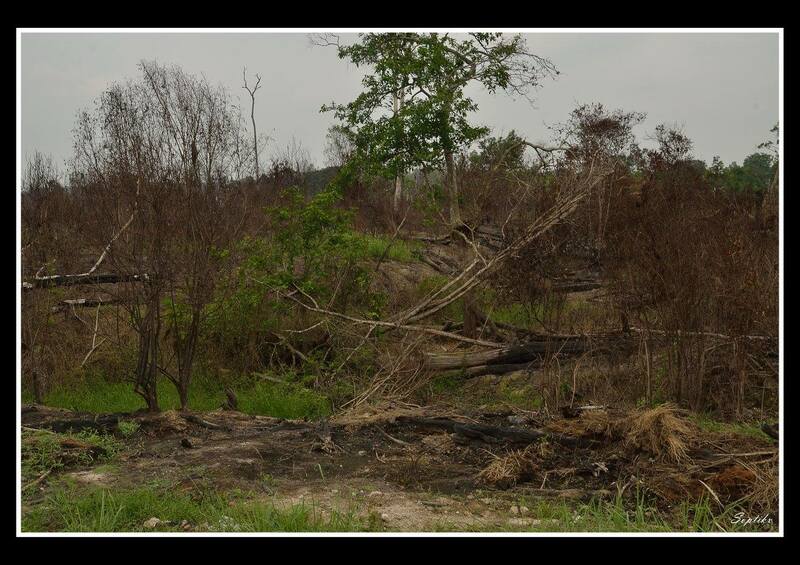 This disaster destroyed the animals’ habitat and increased the loss of endangered species. 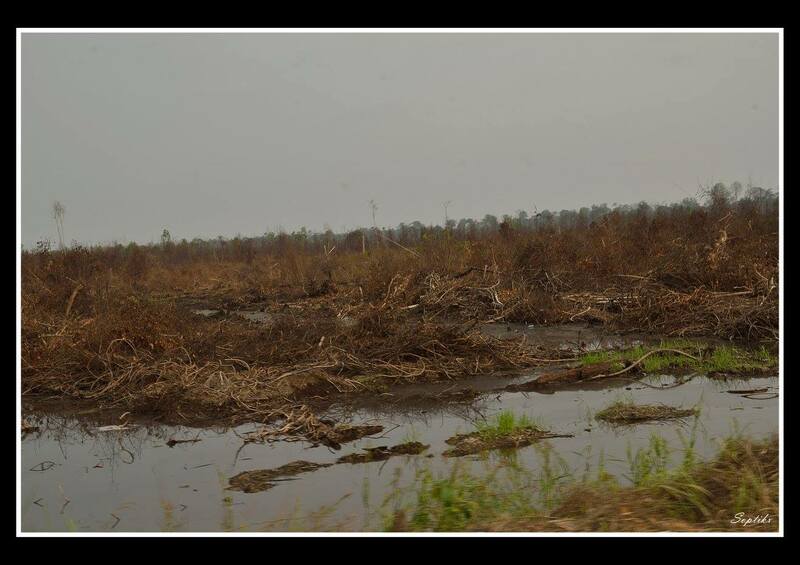 All this happened in the name of palm oil and the paper industry. 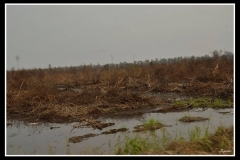 It is the biggest purposely made catastrophe of the 21st century caused by international organizations, companies and nations trading with the palm oil and paper. These companies look after their financial profits only, being regardless to the future of our future generations. What does the global public and media have to say? Most of the Sumatra Island has been deforested with only about 20% of the natural plants remaining in several National Parks (from which Leuser NP is the most significant). 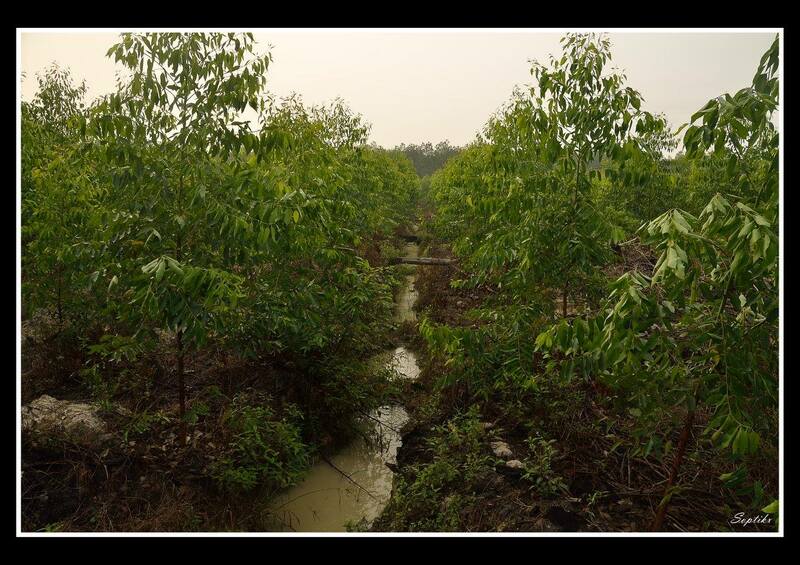 Apart from the huge demand for valuable tropical woods, such as mahogany and teak, another plague disaster has come with planting the rubber wood and oil palms, which are in hands of mengenocide for all living creatures. Millions of hectares of the rainforest had been wiped out and replaced by monocultures of artificially planted industrial crops. This is how the enormous areas of destroyed land (so very close to the National Parks) has been created. Altogether with wildlife poaching for the traditional Chinese medicine or for animal breeding all around the world, the wreak havoc had been completed. The palm oil has become today’s phenomenon as the killer of rainforests and wildlife. It is derived from the oil palm tree, which is being planted on enormous areas of tropical rainforests replacing its natural plants. We add palm oil to petrol, food, cosmetics and lots of other products that we buy all over the world. Because it lasts longer during the manufactory process and it is also cheaper for retailers and producers. That way, the fate for the rainforests has been sealed. People are able to forget about any ethics and choose the path of devastation for few dollars. To top it all, some products containing the palm oilhave BIO label on them which should be telling us that the palm oil is a sustainable resource and so it’s supposed to be harmless to the environment. It is a tremendous lie which gives us the impression that bio products are good for our health and for the environment too. None of this is true because the palm oil destroys rainforests and kills endangered wildlife and it kills us too. It has the worst nutritive value and causes increase of heart attacks, but that is something that the retailers and producers forget to mention. Many companies and retails claim that by using the BIO Palm Oil, you do not harm rainforests and so that the oil is environment friendly. That is not true. Actually the Bio Palm Oil does not exist. It works well as a marketing strategy for international companies that cover their dirty business by putting on this label. Due to the producers’ increased demand for the palm oil, a group of interested subjects (NGO, businessmen and retailers- more than 1300 members from around 50 countries) came up with so called ROUND TABLE. Within the Round Table they created a palm oil certificate. It is so called RSPO certificate (means sustainable palm oil), which is being sold (again, a matter of money). This certificate should guarantee consumers that the palm oil used in that particular product is environment friendly. Parties of interest trading with the palm oil had created their own system and rules for fake “sustainability” due to increasing disapproval from all around the world, pointing at the rainforests devastation caused by planting the oil palm trees. Every plantation can get RSPO certificate and so meet the requirements for the “sustainability”. The plantation can be recognized as “sustainable” only when there are good working conditions for local people, ecological farming and so on. 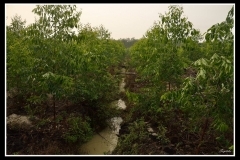 The reality that the plantations are placed in the areas where the rainforests used to be a few years ago with its incalculable natural value, has lost somehow. Day by day the international organizations are burning illegally rests of the rainforests in order to plant more oil palm trees. Due to a huge corruption they will obtain the RSPO certificate in a few years as did many others before them. Local people are poisoning the elephants with poisoned watermelons and orangutans’ hands are being sold for $10 cash, so that the “palm oil” organizations can get rid of those who work hard to preserve and keep the protected areas such as Indonesian National Parks. 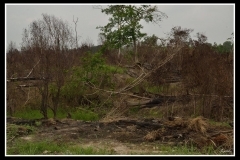 The rainforests are being burnt down every year without any special public or media attention. RSPO (certificated bio palm oil) is a fraud to people and a crime against the nature and our future. Since 2015 it has been an obligation for all producers of the food processing brands, to say what kind of oil had been used in any particular product. The choice is simple. Simply don’t buy products containing the palm oil and go for the sunflower, rapeseed or olive oil instead! Currently more than 70% of all products contain the palm oil…. but yet, there is still 30% that does not. WE HAVE A CHOICE! The palm oil is being used not only in foods but in cosmetics and cleaning products as well. Pohled studentů na používání palmového oleje ze ZŠ Povrly. Tento film vznikl v rámci projektového dne o palmovém oleji. Everyday life in Indonesia, what does the palm oil cause. Having a piece of furniture made of tropical wood such as mahogany or teak, is a sign of prestige and luxury in many households. But the reality of this business is very dark. Despite the fact that this timber is stronger, we have to consider what is behind this piece of furniture. If you can see a beautiful tree that has to be cut down for its profit, instead of a massive table, then you are going the right direction. If you can see instead of it lost homes for thousands of animals from the rainforest, then you would never buy it and you will settle for other type of wood, even though it would be of less quality in many cases.If we realize that a tree is not just a piece of sawn timber but a living organism that has its crucial place in the rainforest, then there is a chance we could save and preserve the rainforests and other forest ecosystems for future generations. Everybody knows that the paper is made of wood. Thanks to huge paper consumption, the forests are being devastated all over the planet. Our savings on paper consumption could bring a big change in rainforest devastation and trees felling. We need to realize that a tree is a home for thousands of various animal species. A felled tree is actually something like animal city being destroyed. Every day, more than270 000 trees have to be felled in order to cover the daily toilet paper consumption in Europe. How to get out of this? Let’s use recycled paper, handkerchiefs instead of paper tissues, cloth towels instead of paper towels. Let’s print both sides and use every little space on the paper for notes. Even these small changes in our everyday lives can bring a big relief for the environment. The bigger consumption of rubber products, latex, tires and toys, the more profitable it will be to cut down the rainforests and replace them by rubber plantations. Let’s try to eliminate our consumptions and always remember that we are not alone on this planet. Many rare wild animals that have the same place on planet Earth as we do willdisappear irretrievably with rainforests being cut down. Leuser NP belongs to the most precious natural gems of the planet Earth. With more than 8000 km2, the rainforest is home for wild rhinos, tigers, elephants, orangutans and many more endangered species. Thanks to this natural variety though, the place has become very attractive to poachers followed by traffickers, smugglers, vendors and breeders! Other interested are those who do business with traditional Chinese medicine. The last people striving forLeuser NP are conservationists fighting against poachers, traffickers, officials and this entire morass that is linked to wildlife trade. Currently the Chinese market desires the most for stag embryos, porcupine gallstones and kidney stones, Loris brains, snake and dragon lizard skin. Of course the demand is high for bear and tiger bones and fur, ivory and rhino horns. Traffickers and breeders have lust for Slow Lorises, songbirds, snakes, geckos, agamas or invertebrates such as spiders, mantises, phasmatodeas… Whether it is poaching for traditional Chinese medicine or for breeding, it is a dirty black market where animals are captured, abused, brutally killed or ripped out of their environment and imprisoned in aquariums, terrariums, cages or some strange paddocks for the rest of their lives. Poaching is crime and everybody who supports this is accomplice of animal abuse. Let’s get back to poachers in Leuser NP. They are just a few villagers, not many of them. They catch the animals into traps made of steel or rattan, or into webs and irons. In most cases they are fully aware of what they are doing, but they haven’t been confronted yet. Maybe some of us cannot see it, but there is a connection between breeding and animal poaching with trafficking. Most of globally-bred animals come from wild nature. From there they get stolen, transported and finally sold to targeted countries, where ownership of exotic animal makes pleasure or subject of business. The breeders often defend themselves by claiming that they are saving endangered animal species. That’s nothing more than a fairytale! Indonesia- this country abounds with an unbelievable natural variety, including animal species that are the point of interest for breeders. Snakes, invertebrates, turtles, birds, small mammals, primates and wild cats. That is a really interesting variety of material for animal trading. We used to live in times when everything had to be smuggled secretly and illegal animal trade used to be considered as a crime. What’s it like today? Based on huge demand for pets, the big money-making process was set into motion. Where can we find breeders? ZOOs, pet shops and private owners, all is connected, everyone knows each other. In the ZOO children find out how wonderful it is to have an animal in cage, they learn how to take care of the animal (more or less) when attending breeding clubs and then they end up buying a pet from a pet shop. Where does the pet shop take the animals from? From breeders and artificial breeding? In some cases yes, but not always. How to do it, so that the pet shop can prove the animal’s origin to the costumer? Let’s go back to Indonesia, where so called BREEDING FARMS have been created. Those are unfortunately but poachers’ places for trafficking. There they put captured and abused animal and create a new origin for it, so they would be able to sell it. The new origin means fake documents, which will legalize the international trade of the poached animal, claiming that it had been bred artificially. Then they only need a signature from corrupted vet doctor, veterinary office and customs office and all is done. The animal is transported through renovated breeding companies to the final destination, where it is checked by veterinary and customs offices. They cannot find anything wrong, because officially the animal comes from an artificial breeding station and so it cannot be a case of smuggling and poaching the wild animal from the National Park. Next step is compulsory quarantine, another “vet’s” signature and there we go – animals are put into cages in pet shops or at breeding bazaars. Then we can see parents with their happy child taking home his/her new pet which is going to be happy because it will get a pretty cage, it will be nicely fed and pet. And that is the most fascinating purpose of the wild animals, isn’t it? To be there for our entertainment. What wouldn’t we do for our “little boy”? But “the little boy” will lose his interest in couple of days and will want another pet. This is how a new breeder is born, who doesn’t understand that the wild animal doesn’t belong into the cage but into the nature. He/she is raised in lie, that this is right, because he/she loves animals, takes care of them and believes that they are happy too, because that’s what is said. It is up to every single one of us whether we choose to be captors or those who will respect the freedom and nature, and will protect animals in their natural habitat (which is not terrarium, aquarium or cage). If any of you still have doubts, ask the question whether you would like to live in a cage? Still having doubts? Try to shut yourself just for one year into the room of 2×2 meters without TV, books, magazines internet and phone. You will get only food, water and every now and then someone will pet you. If you still have some doubts, then do realize, that those animals live their whole life being shut inside cages. It is true, that in such despair, one can get used to anything. But do you want to be part of such abuse and unnaturalness? Is it necessary to have fun at the expanse of animals and give money to ruthless traffickers trading with pain, incarceration and death?